Edmund Husserl (1859–1938), was a German philosopher who created a theory of knowledge called ‘phenomenology’. 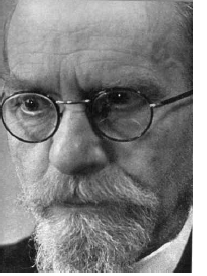 Husserl defines the lifeworld as a place distinct from and different to the more systematic observation and considered reflection that characterises science. [T]he lifeworld, for us who are wakingly live in it, is always already there, existing in advance for us … always somehow interested subjects … as horizon. To live is always to live-in-certainty-of-the-world … [The lifeworld consists of a] naive experiential self-evidence, the certainty of coming to know, through seeing, touching, feeling, hearing etc., the same thing through its properties, through ‘repetition’ of the experiences. [W]hen we are thrown into an alien social sphere, that of the [people of] the Congo, Chinese peasants, etc., we discover that their truths, the facts that are for them fixed, generally verified or verifiable, are by no means the same as ours.